Paul John Tagliabue (/ˈtæɡliəbuː/; born November 24, 1940) is the former Commissioner of the National Football League. He took the position in 1989 and was succeeded by Roger Goodell, who was elected to the position on August 8, 2006. 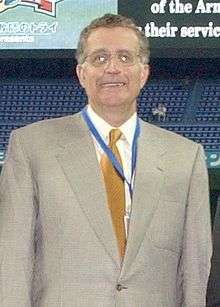 Tagliabue's retirement took effect on September 1, 2006. He had previously served as a lawyer for the NFL. Tagliabue served as Chairman of Board of Directors of Georgetown University from 2008 to 2015. Tagliabue was born in Jersey City, New Jersey, the third of four sons of Charles and May Tagliabue. He is of Italian descent. Tagliabue received an athletic scholarship to play basketball at Georgetown University and was captain of the 1961-1962 team. He graduated in 1962 as president of his senior class, a Rhodes Scholar finalist and a Dean's List graduate. 1992 Eagle Award from the United States Sports Academy. The Eagle Award is the Academy's highest international honor and was awarded to Tagliabue for his significant contributions to international sport. ↑ Eskenazi, Gerald (January 28, 1990). "Super Bowl XXIV; Tagliabue Sweeps Into Action". The New York Times. Retrieved October 13, 2009. ↑ "The Big Man". CNN. January 23, 2006. ↑ "Covington & Burling LLP | Biographies | Paul Tagliabue". Cov.com. Retrieved 2012-10-19. ↑ Mason, Andrew (2001-09-13). "NFL presses on after tragedy". NFL.com. Archived from the original on 2001-09-15. ↑ Baum, Bob (January 25, 2008). "MLK flap shaded first Arizona Super Bowl". South Coast Today. Associated Press. ↑ Anderson, Dave (February 14, 2010). "For Saving Saints, Tagliabue Deserves a Place in the Hall". New York Times. p. SP2. ↑ "Georgetown University: Paul Tagliabue Named Chair of Board of Directors". Explore.georgetown.edu. 2008-12-11. Retrieved 2012-10-19. ↑ "Paul Tagliabue Honored for Work with Gay Group". Outsports.com. Retrieved 2012-10-19. ↑ 2012-9-30-16-00-00 (2012-09-30). "Goodell appoints Tagliabue to hear player appeals - Yahoo! Sports". Yahoo! Sports. Retrieved 2012-10-19. ↑ "FISU homepage". Fisu.net. Retrieved 2012-10-19.